Economics Minister takes off the gloves, tells Al Jazeera interviewer Qatar is funding the murder of children in Israel and Gaza. Economy Minister Naftali Bennett tore into his Al Jazeera interviewer Tuesday, branding the station's sponsor - the gulf state of Qatar - as "the world's greatest funder of terror." 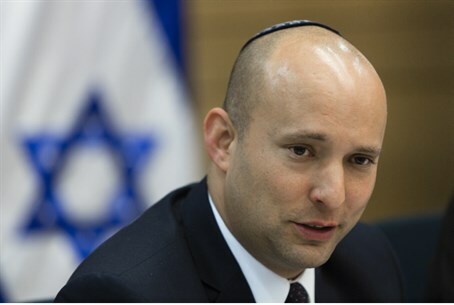 Challenged over the civilian death toll in Gaza, Bennett blamed Hamas for placing rocket launchers among women and children "in the most cynical and cowardly way." "But if we want to put a stop to that - you know how we can do it?" he continued. "You know who stands behind Hamas? It'sQatar, the funders of your own station." "Qatar is funding Hamas with over quarter of a billion dollars - they're funding daily murders of Israeli children and Gaza children and what we need is for Qatar to stop funding Hamas..."
Repeating his calls to stop Qatar hosting the World Cup in 2022 until it ceased funding terrorism, he declared that "a world cup in Qatar would be a prize to terror." During the interview the Jewish Home party leader derided Qatar's role in formulating a failed ceasefire plan together with Turkey and the US, accusing the oil-rich gulf state of funding terrorism "with one arm" while "talking peace" with the other. "You don't host a mega-terrorist and then talk about peace," he said, referring to Hamas leader Khaled Meshaal, who lives in Qatar at the invitation of its leaders. "You don't get it both ways. If you're the world's greatest funder of terrorists you can't be part of the solution - you're the problem." He added that Israel was "doing something no one else is doing" by issuing warnings noting the location of imminent strikes - losing its tactical advantage simply to prevent civilian casualties. "The fact is that Hamas cynically - and so cowardly if I may add - places their women and children to protect the missiles, while we try to thwart the missiles to protect women and children." On the other hand, he noted that Israel would never hesitate to defend itself. "You don't start shooting rockets at Israel and expect that we'll just sit back supinely and die." "It's in our hands to keep the Jewish state alive, to protect ourselves against hundreds of millions of radical Islamists that want to wipe us off the earth - including, I guess, the station that you represent - and history will judge us if we're feeble, if we're not strong enough, if we're not determined to win and beat terror."